PHP :: Bug #58982 :: apc produces tons of warnings "Unable to allocate memory for pool." apc produces tons of warnings "Unable to allocate memory for pool." [Mon Dec  7 14:35:36 2009] [apc-warning] Unable to allocate memory for pool. in /home/hanno/websites/test.hboeck.de/htdocs/wp-settings.php on line 337. Everything seems to work like expected, though this warning pollutes the error log. This does not happen with 3.0.19 (stable) apc or php 5.3.1 (with apc 3.1.3p1). Can you verify that you are not out of either system memory or APC cache memory (check this one using stats on apc.php)? I get the same errors polluting my error log, but in my case for about every php script on all hosts. My server isn't out of memory and I already raised the amount of memory for APC from 30MB to 60MB (apc.shmsize). This did not solve the problem and after downgrading to APC 3.0.19 these warnings stopped from appearing in my error log. I'm sure APC is running out of memory, but it isn't like we can set APC to have unlimited memory. In a hosting environment some people will always have so much PHP that APC won't have enough memory. Having it spit out 2Kbps of error log of the same thing over & over doesn't help. address that and make it not happen somehow. Please read my original report. This is ONLY happening with apc 3.1 in combination with php 5.2. It's NOT happening with apc 3.0 (so it's a regression) and NOT happening with php 5.3. So it's very likely not a general problem but very specific to versions. Happens on this server as well. PHP 5.2.13, not running out of system memory. Not a shared host -- only a single domain. Any progress on this? I'm racking up a php-fpm logfile of about 3gigs a month of almost exclusively APC memory issues. I have free memory on the server, is there a method to make this apc-warning go away? apache the first load of a new .php page triggers the problem. Possibly the reason people don't report is they don't look at their logs? i not have an error log with over 1 million reports of this error in less than 3 days, of course i have multiple sites hosted. Also running Wordpress (effects Wordpress and most other PHP scripts as well it seems). Racking up nearly a GB/day in the error log with this. nginx 0.8.38, php-fpm for php 5.2.13, APC 3.1.3p1. After downgrading APC to 3.1.2 the problem is gone, php scripts are executed in a stable manner. Noticed the same problem with PHP 5.3.2 and APC 3.1.3p1. I have never seen this happen on any server I have set up. and figure out which apc_pool_create() call is causing this. messages so you can identify which one is being problematic. error, after tripling my apc.shm_size it went away. settings. Specifically your apc.mmap_file_mask setting. We are seeing this problem on APC 3.1.4 with 1024MB of SHM. very frustrating, any fixes yet? if you are seeing this. It really should be fixed in trunk. 3.1.4. I'm running PHP 5.3.3 on Fedora Core 12. I saw you were asking questions about the setting). when apc memory reached full, always reproduce this bug. out this warning,just not friendly. All web pages across all domains displayed "Unable to allocate memory for pool." with php 5.2.14 and apc version 3.1.4. After downgrading to apc 3.0.19 the warnings stopped displaying. I have ~30 MB allocated to APC. will be in 3.1.5 which is coming soon. already released (as 3.1.4). But I'll check it out. As an intermediate fix I upped my cache to "70M". I shall try trunk and report back. The problem isn't fixed on 3.1.6 , php 5.2.14, FreeBSD AMD64. Hello I have the same message. This error start to appear after upgrade the apc. The applications generates error 500. Triggered by Magento Community Edition and AMFphp Flash shopping cart. with older mediawiki installs, other PHP based apps. Still happening with 3.1.7 release? we are getting this as well. still no fix? I'm seeing this as well. Is there truly NO apc option that will prevent this message from outputting to the screen? Turning off PHP display errors did little to remedy this issue for me, and tweaking various apc settings only delayed the problem instead of solving it. files to be included twice. apc defaults, it worked (so far) for me. We solved this problem by allocated a much larger cache size, and the error never came back, even after the larger cache filled up. Perhaps that means that the warning occurs when fragmentation or block sizes confuse apc into not being able to find a large enough free block, i'm not sure. had the same issue on centos 5 with php 5.2.17 and noticed that if the cache size is small and the ttl parameter is "high" (like 7200) while having a lot of php files to cache, then the cache fills up quite fast and apc doesn't find anything which it can remove because all files in the cache still fit in the ttl. increasing the memory size is only a part solution, you still run in this error if you cache fills up and all files are within the ttl. so my solution was to set the ttl to 0, so apc fills up the cache an there is allways the possibility for apc to clear some memory for new data. Not sure if this is related to code, but it's a symfony 1.4 + Doctrine 1.2 project. I have latest APC 3.1.6 from Gentoo and PHP 5.3.5. This bug is reproduced for me only when cache is almost full and badly fragmented. It this case APC can't allocate large enough block for caching a new file. It would be great to perform defragmentation or empty stale items on this stage. the cache is much slower than serving up the script uncached. without spewing a million of them. But this is a stalemate situation actually - when you have fragmented almost full cache - nothing is cached anymore and stale items are not released. They will be only released when big enough file is requested or lot of small files requested. I think that in this situation APC should at least start the same logic as in case of full cache. You are not able to increase the size of cache all the time. And sometimes it's ok to loose files not used frequently from cache. Even an option in config would suffice. For what it's worth, I found this page searching for the same problem. Changing apc.mmap_file_mask=/tmp/apc.XXXXX to apc.mmap_file_mask=/dev/zero resolved the problem as far as I can tell. It's the only change I've made, and the problem doesn't seem to be coming back. I'll post back if it does come back. Using apc.mmap_file_mask=/dev/zero worked for me (so far) as well. Thank you, bstillman. at no use for the PHP developer, it should be hidden. I have PHP 5.3.3 and APC 3.1.7 in a high traffic web environment and we I am getting the same warnings. I tried Changing apc.mmap_file_mask=/tmp/apc.XXXXX to apc.mmap_file_mask=/dev/zero and for some reason my NGINX page requests per second and Apache page requests per second doubled. I my case I preferred keep the warnings until I find a better solution. Same issue here. All of our sites just randomly went down due to this. 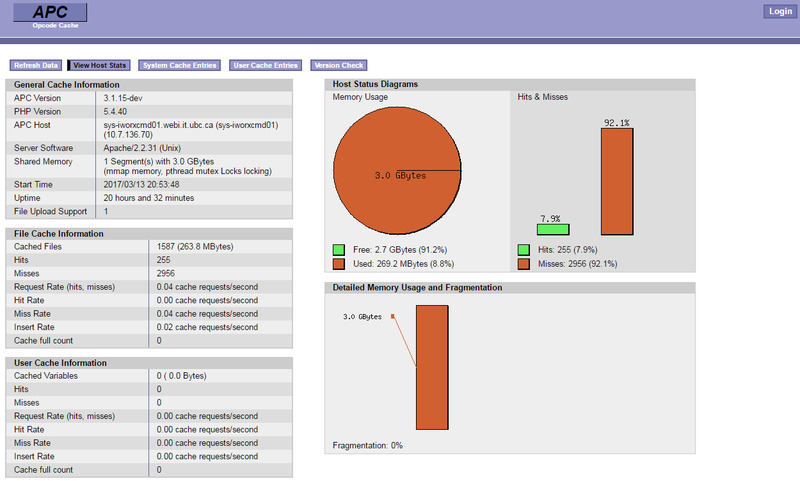 Running APC 3.1.6 with PHP 5.3.5. Still no solution? This was happening for me on PHP 5.3.6 and APC 3.1.7 on Debian. It works now. The easiest way to test it was to load up few large web applications and cycle through the tabs. Trivial to trigger before the change, unable to trigger after. Could it be that the PHP is too old? I just got tons of error messages based on 'Warning: require_once(): Unable to allocate memory for pool' all over my Drupal sites. Added 'apc.mmap_file_mask=/dev/zero' to php.ini and now there gone. Thank you! As I posted three or four comments above, I am running 3.1.9 and it is still there. sometimes, it does not rotate. I can't install debug versions on this box, as it's puppet controlled by Ops. Also, my app is Moodle, just in case that's relevant somehow. We seem to have run into the same problem on one server. Running php 5.3.4 with apc 3.1.9. Unfortunately it only seems to occur after quite some time running with a cache (maybe a day or more) so I don't have an easy testcase to reproduce it directly after apache-restarts. at once, happens around half an hour after apache reload. Another reason for that error is if apc_bin_* functions are used in apache. Ideally, they're only good for command line apps - because the apc_bin_load() allocations qualify as memory leaks in shared memory, because the entire cache entry set is tied to a single allocation - so even an apc cache clear won't free up memory. That's the only scenario where we probably would spam the log with such warnings consistently - any other scenario will only log it till the cache clears. I've had this problem on PHP 5.3.8 and APC 3.1.9. Fixed it like xantek proposed. Seems to be problem if any value than zero is set to "apc.ttl" variable due to that cache content can not be replaced with new content. I'm unable to change the bug state, but I want to ask to re-open it. exists and a fix is available. Afair it is fixed in the latest releases, please try it. version I used when I first encountered this bug. Well its now 2013, 4 years later and this problem persists. I ran into this problem for the first time in 10yrs of working with php and apache. This occured on my test server with 4gigs ram. I used top, htop and other tools during this error and all report that i have at least one gig of free memory. There must be some kind of configuration error somewhere. Either that or im running some seriously badly coded php app. To find out systems cache settings via terminal type: sysctl -a | grep -E "shmall|shmmax"
not knowing what to do, i just herp and derp increased all of my mem and cache settings in both http.conf and set my prefork to lowest possible values. ....now im playing around with SELinux to block some apache modules because i had them all unblocked under SELinux. I never ran into this problem before. I just edited my php.ini file and set output_buffering = Off  . This seems to fix the problem for now. Hello, i am back. I just tested another version of the same php CMS on the same server with the same php and http config and i am having no problems. I am now close to certain the issue resides in bad php code. My issue is confined to a custom packaged version of drupal 7 with a theme. Nevermind my previous comment. My other test cms sites also do not work haveing the same issue. Tried a clean install of latest barebones drupal and same issue. Now everything is working great and 100x faster! I think APC got installed on my test system automatically when i was updating my linux distro. In conclusion APC has given me a lot of grief. It has wasted an entire days worth of my time. I'm removing apc. I don't know the consequences of the "sure-fire" fixes offered and I've wasted more time than this problem is worth. I'm pretty unwilling to run non-standard versions of anything, if you fix this in the next 24 hours it's still going to be ages before it gets through RH and Centos to me. The root cause seems to be the ttl of cached items which cannot be overriden even when the cache is full. On centOS the default value is tt=7200 and we ran into trouble as soon as cache was filled. We put ttl=0 (as we used to do on previous ubuntu servers) and problem disapperaed. The cached files are kept forever but if cache becomes full (although we provision it with enough shm_size) apc could clear some ones to write the new ones. I think it once was a bug, by today I would say its a behavior, but the documentation and error message could be more specific for this issue. either the fix is not distributed in ubuntu distros or the mentioned fix of rasmus didnt fix the cause. We are also experiencing this issue. I checked our apc.php output and was a bit confounded. Could someone explain why the numerical output is different from the chart in terms of memory usage? This host is running RHEL6.8.